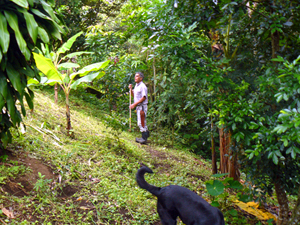 Here on a hillside 10 minutes' walk from the lakeside village of Tronadora is a fertile little finca with a year-round stream running through it and fruit, vegetables, exotic plants, indigenous trees, and pasture growing just less swiftly than Jack's bean stalk. 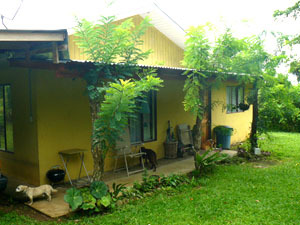 The house, a traditional Tico home except for having two bathrooms, sits on a nicely groomed lot beside the single lane that runs through the quiet village of Chimurria (El Roble). A shy quarter of the house, including one of the bathrooms, has been remodeled for use of the owners, when in residence. 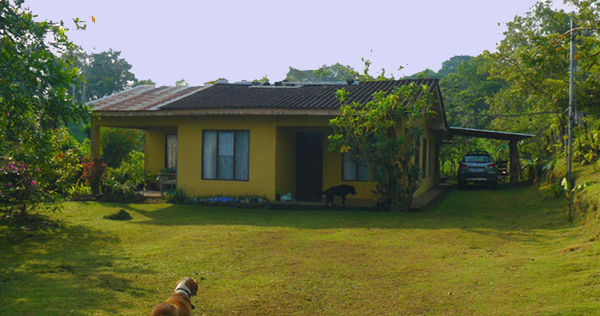 The rest of the house is occupied by a retired Costa Rican couple who provide security and grow fruit, vegetables, flowers, and medicinal plants for their own use, selling the excess. This same arrangement could continue for a new owner, or else a buyer who wishes to liver here full-time could do so and continue the remodel at his her own pace. The area is home to quite a few expats and there is a lot of pleasant socializing among them. For a hobby farmer who wishes to raise enough to sell, there is a popular biweekly feria (fair) at Cinco Esquinas (5 Corners), just a couple of miles away where Gringos and Ticos bring quite a variety of fruits, vegetables, plants, pastries, cheeses,other edible goodies, artwork, and much more to sell and exchange. The stream enters the property below the home, winds through the upper half and forms the northern border along the far end of the gently sloping property. 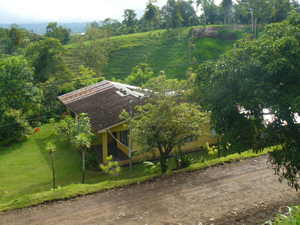 The house is beside the single lane that runs through the village of Chimurria (also known as El Roble). 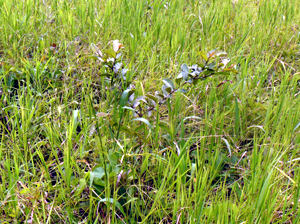 With cows gone, natural vegetation along with new fruit trees and truck gardening is reclaiming pastures though much fenced pasture with good grass remains for horses or cows. 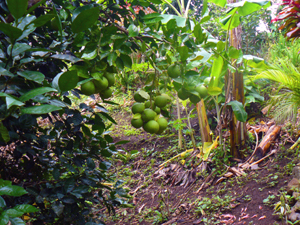 Orange trees and banana trees are among the fruits growing on the hillside below the house. The year-round stream pools in the lower end of the property before taking a short plunge. It is about a 10-minute walk from the property H210 at left to the stores and bus stop alongside the soccer field in the center of Tronadora. 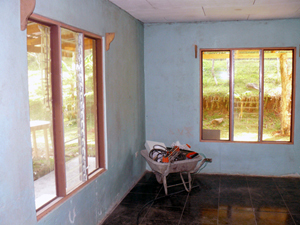 The house has two patios at the front, both entering to the large living room, dining room and kitchen area. At right rear a new carport is attached outside the quarter of the house that has been updated to an apartment for the owners when visiting. The rest of the house is occupied by the caretaker couple and includes a storage and laundry room. The apartment has a modern bathroom with on-demand hot water 2 bedrooms, one of them in combination with the living room, and a half-kitchen with refrigerator and small appliances. The caretaker tends to the fruit trees below the house. 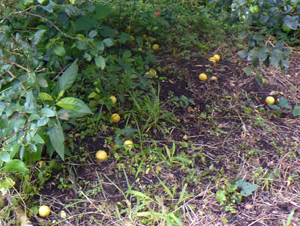 The caretaker has cut paths among the fruit trees and beyond. Oranges fall from overladen trees. 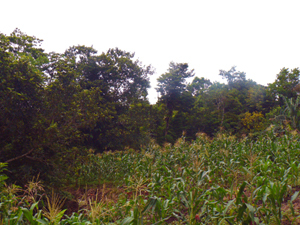 A small cornfield near the hillside orchard. 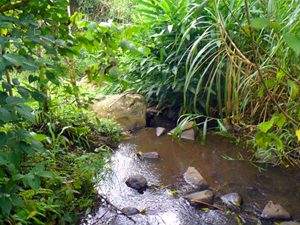 The stream enters the small finca at the upper south side of the property and passes below the hillside orchard. 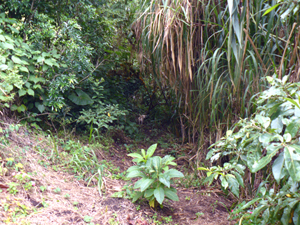 With cows now long gone from the finca, a path now cuts through the thriving native plants to reach the far end. 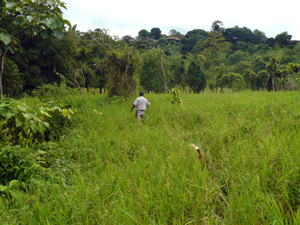 No longer sustaining cows, the grass grows high at the far end of the finca, as do new native trees no longer eaten by cows. With grazing stopped, native trees are growing up through the long grass in the pastures.. The house and its large level yard as seen from the home across Chimurria's single lane. 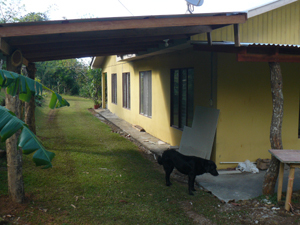 Construction underway on the apartment, carport and covered walkway. The construction finished, the walkway's new posts assert their treeness. The apartment's LR/BR under remodeling. 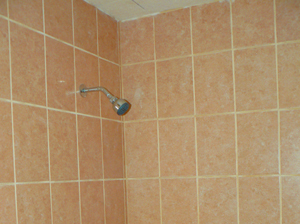 The new bathroom provides hot showers. 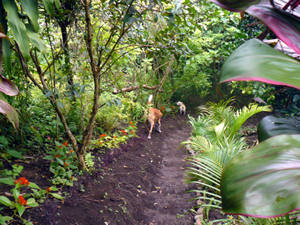 A little-traveled lane climbs the hill above Chimurria providing a wonderful early morning hike for an owner and canine adventurers. Lake Arenal as seen from the lane above Chimurria. This lane and the other lanes it connects to enable not only long hikes but long rides for horse owners.